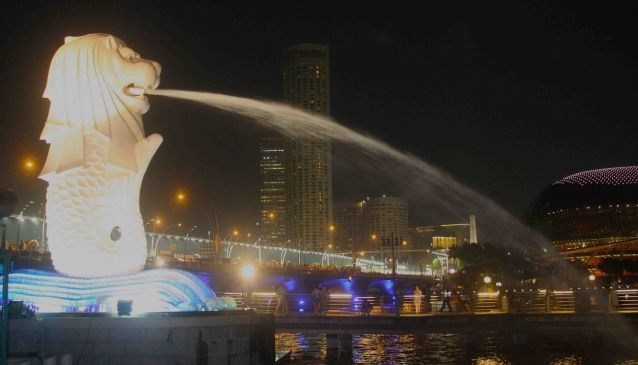 If you come across something coming in at 8.6 metres high and weighing 70 tonnes which has a lion's head and a fish's body, you are witnessing the architectural icon otherwise known as the Merlion statue. The icon is located near the famous Fullerton Hotel and the Esplande, with splendid views of the entire Marina Bay area. The white-cement artwork was created in 1972 by sculptor Mr Lim Nang Seng to illustrate Singapore's creation, the story of the fisher village Singapore once was and how the city got its name. The lion head with a fish tail is not only a fantastic sight; it is also often printed on T-shirts, mugs, hats and other souvenirs. It certainly is Singapore's most cherished mascot. The Merlion Park is a great outing for the entire family, especially in the late afternoon and early evening hours when the sun goes down behind the CBD and sets the entire Marina Bay Skypark, Art Science Museum, Helix Bridge and Singapore Flyer on the opposite side of the Marina Bay, in a beautiful soft light. It is also a fantastic spot for taking night photos and to experience the impressive 'Laser Show' from the Marina Bay Sands. There are several restaurants and bars located along the pier and a pathway under the bridge that brings you directly to Boat Quay along Singapore River, passing by the ACM, another must visit when in Singapore.